Trigger Warnings: Mentions of Physical abuse, Bullying, Suicide, Death from cancer, Death, War, Drinking, Alzheimers, Profanity, Drug use. 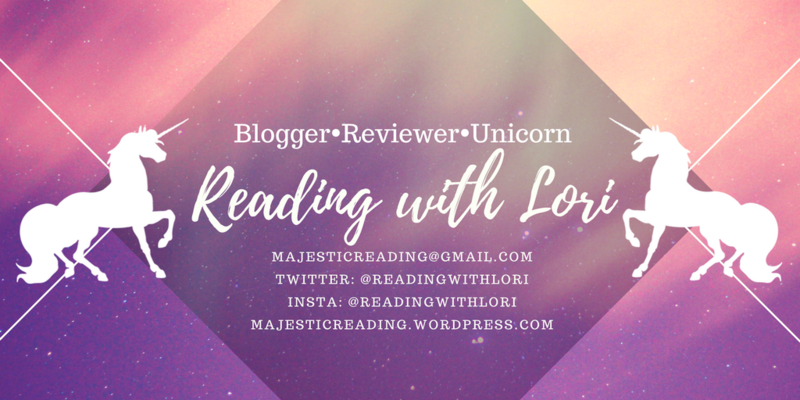 Hey Unicorns, it’s Lori!🦄 I hope you enjoy reading this review as much as I did writing it. Don’t be intimidated by several amounts of Trigger Warnings because this book is truly interesting. But if you are Triggered by any that I mentioned I suggest you not read it. I honestly was addicted and needed to read more once I finished each chapter. 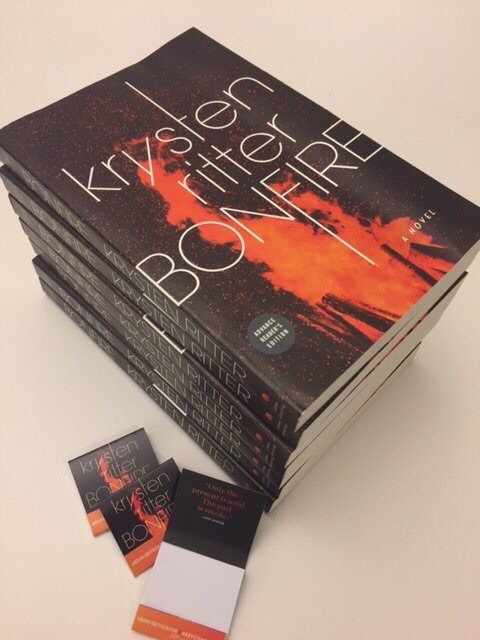 Honestly, I’m considering on re-reading Bonfire because of the suspense that is perfect for the Fall especially with Halloween coming up. You never know who to trust & what to believe the deeper you read. The truth will truly shock you as it did with me. Abigail Williams is a flawed character amongst others with similarities that will be unraveled. I also want to warn you about the Trigger Warnings because honestly, this book took me a while to complete not only was I busy, but I had to take a break from reading altogether. I’m a highly sensitive person and incredibly empathic which caused me to easily be triggered to events that occur in this book. Certain scenes were to much to bare and had to take a day or two break. Suicide and bullying are the two main topics that reoccur throughout the novel and at times it was devastating to read. I also want to mention that I’m glad this book discusses suicide and bullying in life because it happens everyday. You are not alone and YOU are valuable. I usually don’t discuss personal issues, but I was having a few flashbacks/PTSD when reading because I could relate to it personally. I did continue reading and I’m glad I did. If you also love investigative thrillers THIS is the book for you! This book has deep dark twists that is truly interesting. 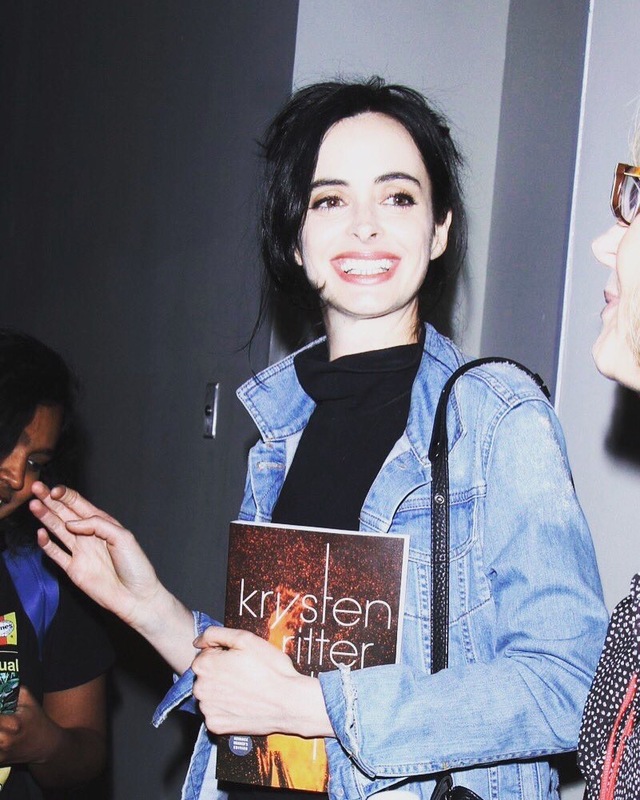 I give praise to Krysten for writing this stunning thriller while she was filming which is incredibly difficult to do. 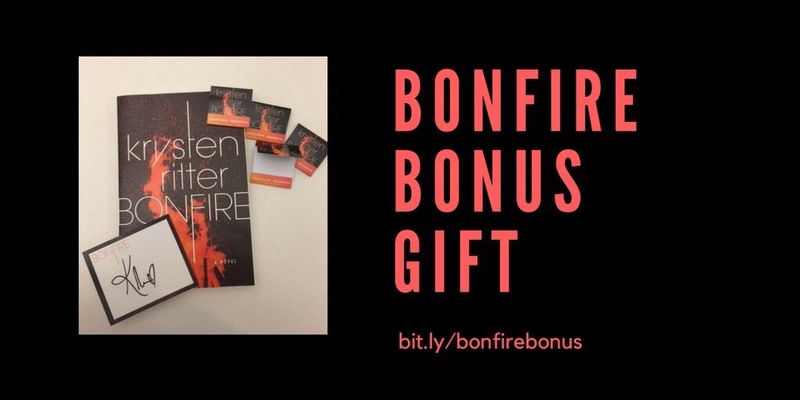 Bonfire is WORTH the read! 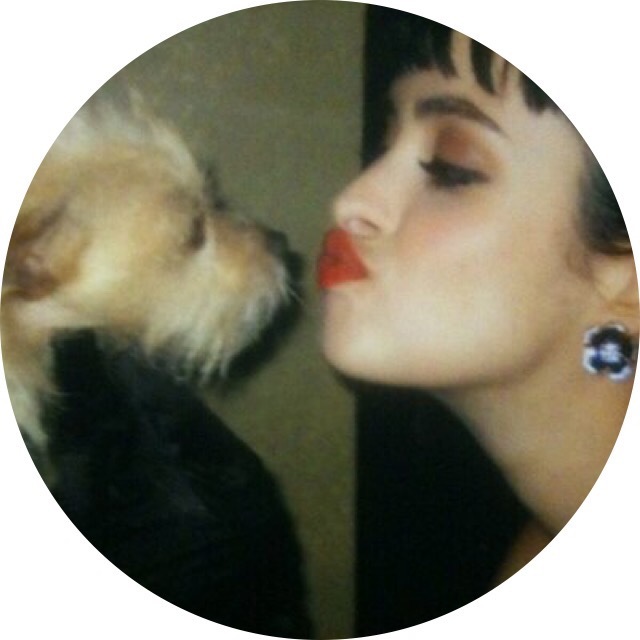 Krysten Ritter is an American actress, musican, writer and model. She is known for her roles as Jessica Jones, Jane Margolis on Breaking Bad and Chloe in Don’t Trust The B—- In Apartment 23. She currently lives in New York City, she also sings and plays guitar in a band called Ex Vivian. She also promotes animal rights and posed for a 2013 PETA ad campaign warning pet owners of the dangers of leaving dogs in cars during the summer. She has a pet dog named Mikey. 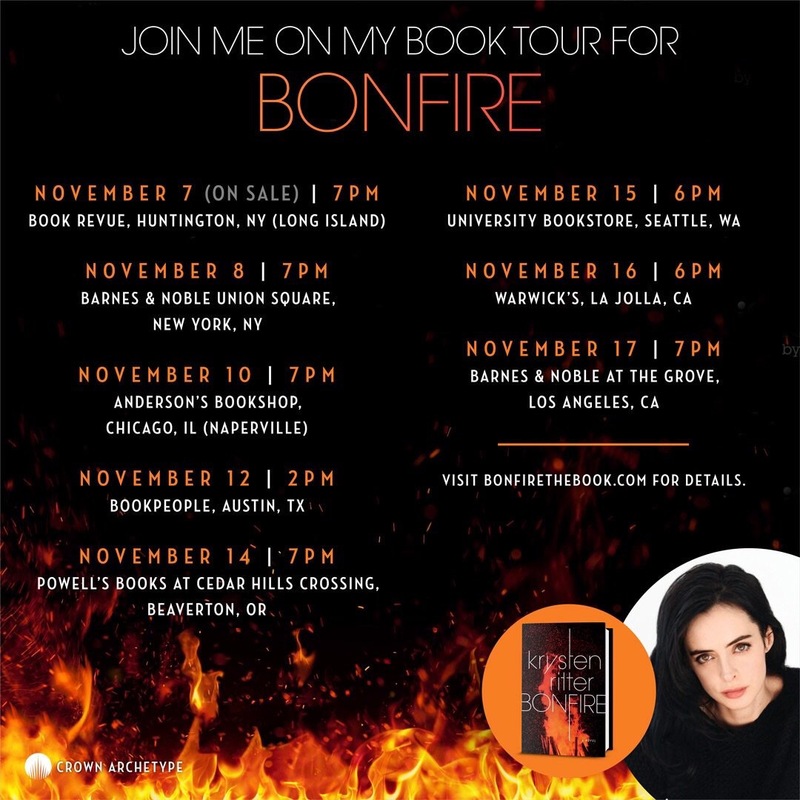 Krysten is also going on a Booktour. Is she signing near you? Lori’s QOTD: Which Thriller/Suspenseful book will you be reading for Fall? Comment below I want to hear them! Previous Post Speak Easy, Speak Love Review, Character Quiz & Author Interview! Next Post Inkmistress Book Review, Author Review + GIVEAWAY! Thank you for the trigger warning! Much appreciated. AWW MEG YOU ARE SO SWEET THANK YOU!💋 Yes, you gotta read it!! OMG! I didn’t know she had a book coming out! Looks interesting! Nice review! I’m not sure about this one for myself, but I’m glad you loved it so much. I like that you list the trigger warnings for people. Haha never ending TBR list lol. This is totally worth the read! I can’t wait to read this book. Though the trigger warning of suicide does give me pause. Great review!! This sounds a little too spooky for me lol!! I’m a big baby sorry!! This looks sooooo good! I don’t really read thrillers but I may just have to give this one a go! Great review! Love this cover! You make me want to pick up every book you write a review for! This one included! This sounds so good! I also did t know the author was an actress! That’s so cool! Awww that’s sweet of you to say! Thank you Danielle💋 You totally should pick it up! OOOO I like the sound of this book!